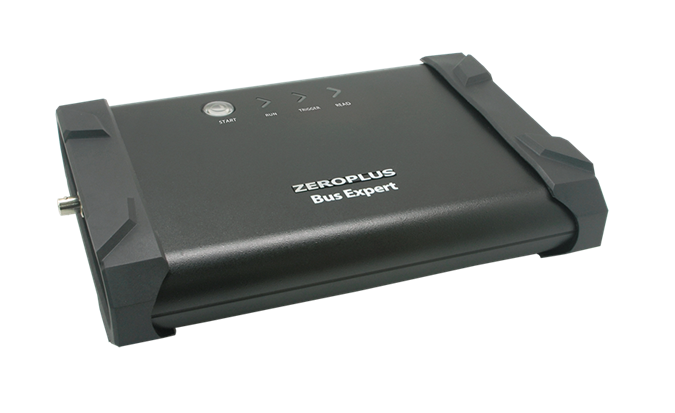 “Bus Expert” is a PC-based instrument specialized in eMMC/SD protocol measuring and analyzing. Its 1.6GHz timing sampling frequency could meet the requirement of signal measuring of eMMC4.5/5.0 or above. In the past, PC-based instrument always be thought to having sampling shifting of high frequency signal and low clock accuracy, but this product has added fine tuned front circuit probe for each channel and developed emulated calibration of 78ps high resolution, and that would solve the problem of timing shifting and greatly reduce the possibility of signal be decoded wrongly. It is surely an advanced product in the PC-based area. eMMC specification has developed to version 4.51 and 5.0, outpacing the researching and developing of many opponents, but we have joined the JEDEC and keep updating Bus Expert. Now Bus Expert supports eMMC5.0 specification, standing firmly at the peak in the market. This product focuses on accuracy trigger of Logic Analyzer and requirement of long time recoding event log of Protocol Analyzer; it could be used to verify functions and import debug program of IC design and System design. Through the identical analysis platform, communication barriers between hardware and software could be eliminated, so product could come into the market much earlier. Combined with patent technology of high memory size of logic analyzer, this product could capture signal for hours, which is four or five times longer than that of some well-known brand in the market, so event log could be recorded for a long time. In the software, the patent navigator could let engineers freely hide or expand data and quickly find the error in their lengthy CRC Error signal tracking.